The Sandpoint Rotary and CHAFE 150 Gran Fondo donated a check Wednesday for $50,000 to the Lake Pend Oreille School District (LPOSD) to assist children on the autism spectrum. This is the fourth year the Sandpoint Rotary has presented the event. The ninth annual CHAFE 150 Gran Fondo took place on Saturday, June 18 in Sandpoint. At 310 participants registered for the ride this year, it is the highest participation in the event’s history. The 150-mile route starts at Sandpoint City Beach and makes a loop around the Cabinet Mountains following the lake and river valleys. There are also 80- and 30-mile loops for riders not wanting to commit to the full ride. This year, 75 sponsors helped raise over $50,000 and 120 volunteers helped make the CHAFE 150 a success. 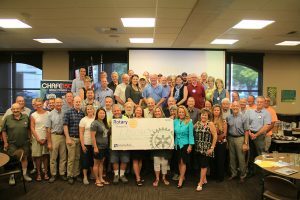 After their regular meeting on Wednesday, the Sandpoint Rotary presented a check for $50,000 to LPOSD to help area children on the autism spectrum. In the four years since Sandpoint Rotary has sponsored the CHAFE 150, they have donated $160,000 to LPOSD. Next year’s CHAFE 150 Gran Fondo will take place on Saturday, June 17. Donations are accepted year-round by visiting CHAFE150.org. Next story Hast thou forgotten about Shakespeare in the Parks?